Each of these websites have information about incidents that have occurred, all of which provide an opportunity for us to improve on the tactics of our professions. As a reminder, as we move forward following winter weather we should look back at the things that have worked well, and take the opportunity to improve where we can. It is known that even vehicles abandoned on the shoulder of the highways have a significant impact on traffic flow. When winter weather is expected, effort is made to remove these vehicles as quickly as possible. This is done for several reasons, safety, ability to plow shoulders, visibility, and congestion, etc. These abandoned vehicles pose the same issues when the weather is good. The longer these vehicles are allowed to sit abandoned on the highways, the greater the likelihood that they will cause a crash or be vandalized. At the very least they cause congestion on already congested highways. We should learn from the experience of bad weather and remove abandoned vehicles as quickly as possible no matter the weather condition. National Work Zone Awareness Week 2017 will be observed April 3rd – 7th. The theme of this year’s event is “Work Zone Safety is in Your Hands”. The kickoff event this year will be hosted by the State of Maryland. National Work Zone Awareness Week (NWZAW) is an annual spring campaign held at the start of construction season to encourage safe driving through highway work zones. The key message is for drivers to use extra caution in work zones. I hope responders from all disciplines will participate in the National Work Zone Awareness Week activities in your area. Although highway incidents are not routinely referred to as work zones, they are work zones and we should work to set them up as such. Using the recommended, or required, traffic control for highway incidents helps to reduce the confusion on the part of motorists and provides additional protection for our personnel. For more information, I have included a link to the website. March is Alternate Routes Month. Responders from all disciplines should be aware of the alternate routing in their areas for the times that incidents occur requiring the rerouting of traffic to alternate roadways. There should be alternate route plans in place across the United States. However, not everyone who is affected by these plans know of their existence. When approved alternate routes are not used, we risk another incident occurring. Many roadways and bridges will not handle the loads that are diverted. As I mentioned, alternate routes plans are in place. These plans should be reviewed with all personnel, from all disciplines. When you have your next TIM Meeting, bring those plans so that all can review them. If you are not familiar with the plans, contact the DOT or Public Works office in your area to review the plans. A little preparation may prevent an incident occurring because of diverting traffic onto an unapproved route. I am still waiting on the huge increase in membership. Please encourage your friends and colleagues to join The TIM Network. As the process of upgrading the TIM Network and the website, this will be the best place to go for Traffic Incident Management information. Take care of each other, watch over your personnel, and remember to do the right things. Our lives depend on it. I was reminded that many of the Baby Boomers are retired and a new group of TIM Responders are being hired or taking over leadership roles. FHWA TIM is a link to a lot of info for you to study. FHWA TIM The FHWA Emergency Transportation Operations (ETO) team contributes to major program initiatives tied to FHWA and USDOT Strategic Implementation Plans. SR 11/15 and SR 22/322 are the two major routes to access the capitol region of Harrisburg from Western Pennsylvania. On SR 11/15 two locations were creating a bottle neck as rock formations were just off of the southbound lane of travel on the berm. These locations were deteriorating as rocks were falling onto the highway. PennDOT performed a construction project on SR 11/15 to alleviate the issue. Prior to the construction project, PennDOT engineering established the alternate route for Harrisburg traffic as SR 22/322. 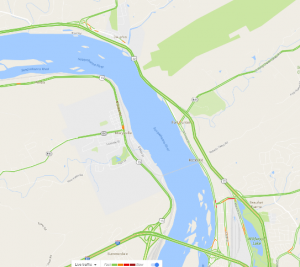 PennDOT engineering and the Eastern Region Traffic Management Center collaborated as the RTMC advised the engineers that SR 22/322 was a high incident area. PennDOT then invited local government officials and first responders into the discussion to help the emergency planners in the process of ensuring a smooth flow of traffic to Harrisburg if a traffic incident would occur. A 3-mile stretch of SR 22/322, as shown in figure 1 was identified, as there were no alternate routes during emergency incidents that could be used. To correct this deficiency the planners agreed that contraflow gates would need to be installed in this area. The contraflow gates were installed in the area to ensure traffic could be managed through the possible incident zone ensuring that stuck queue traffic would be relieved. A public-private partnership was established with a local heavy towing business to pre-stage a heavy tow in the 2-mile area while the construction project was being completed. Though the construction project is complete, the contraflow gates are still deployed in this area to assist first responders during critical traffic events. It was 19 years ago today that a Firefighter was struck and killed in the Line of Duty on the Pennsylvania Turnpike. But in this case, his death was not in vane. He death-as horrible as it was-mattered and resulted in the saving of numerous other Firefighters, EMT’s, Police Officers and other emergency service personnel. On March 9, 1998, Firefighter David Good was 38 years old and had 5 years of service as a Firefighter with the Lionville Fire Company when he was killed. He was survived by his wife Maryanne and two sons, Johnathan and Jason Good. At 1438 hours, as personnel were loading the accident victim into an ambulance, a tractor trailer traveling westbound lost control and crashed into the Assistance Chief’s vehicle, overturned, and slid into the back of the ambulance and the other responders in that area. The Assistant Chief and a Firefighter with him in his truck were trapped in the severely damaged vehicle and had to be extricated by mutual aid rescue personnel using the Jaws of Life. Firefighter Dave Good of the Lionville Fire Company was killed in the line of duty. Nine other emergency responders were injured, three seriously. That incident 19 years ago eventually led to the production of a video called the “10 Cones of Highway Safety” and a training program about Highway Safety both by VFIS. It also was one of two Firefighter struck-by-vehicle line of duty deaths in 1998 that led to the formation of the Emergency Responder Safety Institute: www.respondersafety.com. Responder Safety-and the folks that run it-have made a measurable difference in our awareness of roadway survival. Between the Lionville, ERSI, VFIS and other folks-Firefighter Good is truly remembered through training and prevention of what they experienced-19 years ago today. From “those ugly stripes” on the back of your rigs to those “damn hi-visibility vests” to “all those frick’n traffic cones” …these tools have absolutely helped more of us survive on the roadways. Rarely if ever seen 20 years ago, they are out there now-more than ever. TUESDAY MARCH 28 at 1300 Hours est. Featuring those who were involved with the loss of Firefighter Good and others-and what they did to make sure these deaths are not in vane. * Command disputes/communication issues that sometimes take place at the scene and how to avoid them. * Importance of high-visibility PPE and related policy. * Advance warning signs and devices. Firefighter Daniel Eugene “Wolfey” Wolfe. Wolfe retired from the Harrisburg City (PA) IAFF Local 428. He also was a member of both the Paxtang (Co. 40) and the Mount Pleasant (Station 8) fire companies in the Harrisburg area. RIP. See the below links for traffic forums written by Jim McGee! Local officials can look to state DOTs for ways to improve operations.